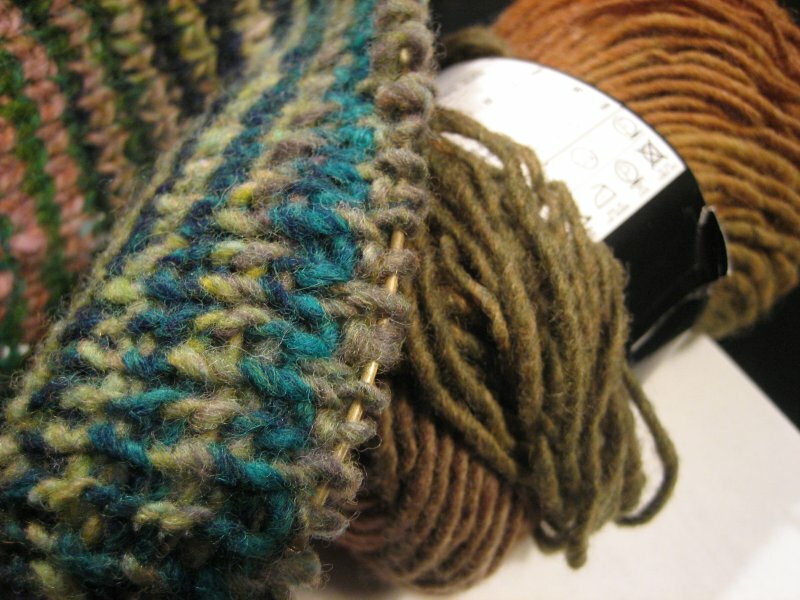 The Knitting Pirate » In Which the Pirate Is First Annoyed, Then Thrilled. « In Which the Pirate Does Not Spin. In Which the Pirate Is First Annoyed, Then Thrilled. Here we see the Stripey Striped Scarf, moving past the salmon and sugar snap peas into the blue of night and the pale grass of morning. I am loving this scarf. It's mindless knitting. It's going to look so good when it's done. It's... what's this? What the heck has happened to my yarn? There is a knot. In my Kureyon (third ball). What happened to my slow gradual color change? This goes "green green green KNOT pink pink"! That's not right at all! Augh! What to do? 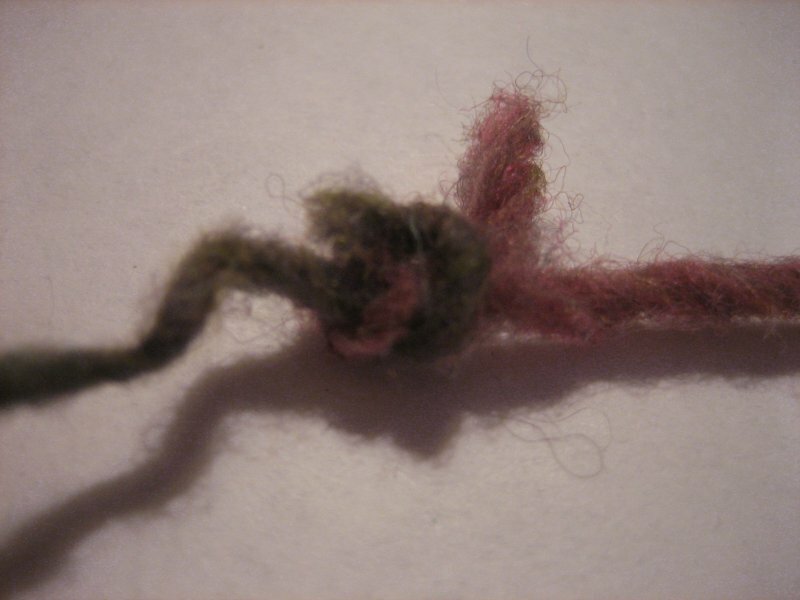 I briefly consider that I have about two feet of green before the knot; I can untie it and gradually felt the pink in. That will mimic the color shift, right? Of course. No panicking. I get ready to felt. Then I realize that the next (fifth) ball might have a matching section. I pull it out of the basket and stare. The shade of green just before the knot in the first (third) ball is so very close to the shade of green which begins the next (fifth) ball, though they are totally different colorways. This is just too cool! The scarf is already almost 45" long, and the next two balls (fifth and sixth) plus the as-yet un-knotted bit of the fourth ball should bring it well up over 72" unblocked (or, IMO, the perfect length for a scarf). I'm not going to worry about the non-matching end of the third ball of yarn. After all, it had one knot - how can I trust the rest of it? 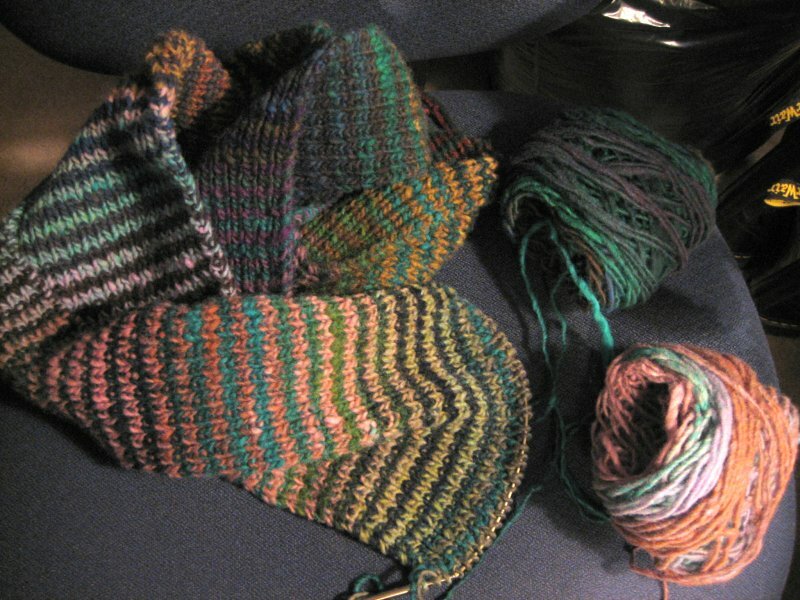 Color shifting saved, I am going to go wind up the next (fifth) ball of yarn. This is just awesome. This entry was posted on Wednesday, September 5th, 2007 at 20:13 and is filed under scarf, stripey striped scarf. You can follow any responses to this entry through the RSS 2.0 feed. Both comments and pings are currently closed.